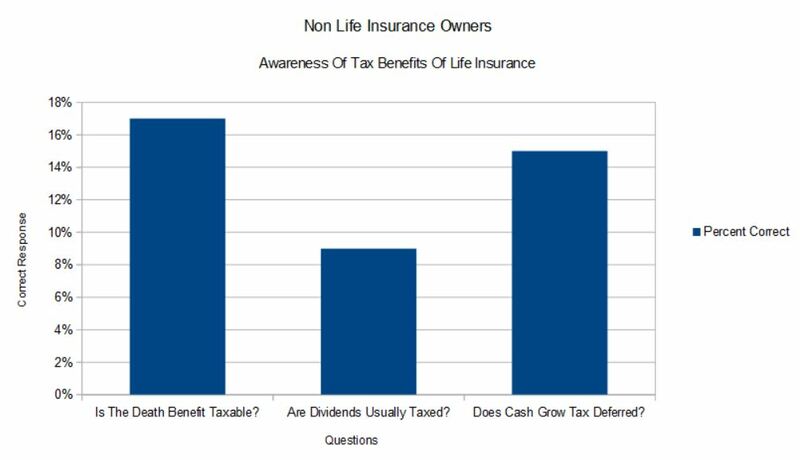 Over the past month, Life Ant commissioned a survey to find out if people were aware of the distinct tax benefits of life insurance. We didn’t expect to find the vast majority of people to be aware of life insurance taxation, but what we found was a little surprising. As it turns out, almost no one knew even the very basics about the tax laws around life insurance. For instance, only 23% of the people we surveyed knew that a life insurance death benefit is paid tax free to the beneficiaries. Far fewer knew that the life insurance value grew tax deferred, and fewer still knew that dividends are not taxable (up to an amount equal to the total premiums paid). We asked both owners of life insurance and non-owners of life insurance. While people who owned life insurance fared slightly better, it was astounding to learn that even the owners knew little about the products that protect their families. Here are some of the results. So as to reduce the chance of an accidental correct response, we provided multiple possible responses for each question. Here is the first question to demonstrate an example of how the questions and responses were structured. We believe this did a fair job of rooting out accidental correct responses. Question #1: Is a life insurance death benefit usually taxable for the beneficiaries of the claim? Yes, at the marginal income rates. Yes, at long term capital gains rates. Yes, at specific tax rates for life insurance which vary according to the size of the claim. Yes, at a 15% rate. Yes, at a 30% rate. All respondents were asked to verify their age, and only those age 25 and older were counted for the purposes of this data set. 200 people were surveyed, 100 owners and 100 non owners of life insurance. We did not ask which type of life insurance product was owned. Age of respondents ranged from 25 to 68 years. This is how respondents who said that they do not currently own life insurance fared. Clearly people who do not own life insurance do not know much about how it is taxed. What is especially surprising is how few people realized that the death benefit is not taxable in most cases, because this is one of the biggest benefits of life insurance. Here is how people who do own life insurance performed. People who currently own life insurance did not fare much better with only 29% of the respondents correctly identifying if the life insurance claim is usually a taxable benefit. We can probably partially attribute the fact that people knew little about dividends and cash value growth to the high percentage of term life insurance ownership (term has no dividend or cash value components). The results are still surprising nonetheless. Most people are very unaware of the distinct tax advantages of life insurance. Greater education by the financial advising industry would probably be helpful. Many people who don’t own life insurance may be more likely to purchase the insurance if they were aware of the tax benefits. 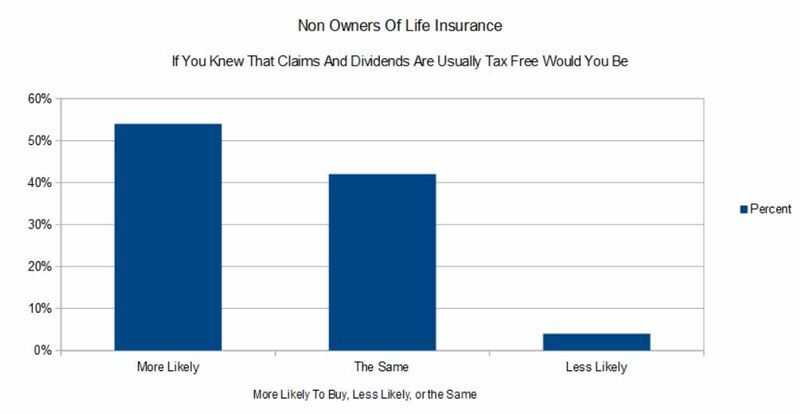 After the survey non owners were asked if they would be more likely to buy life insurance if they knew about the tax advantages. Here are the results. 52% of respondents said that they would be more likely to buy life insurance of they knew that the claims and dividends are usually paid tax free. From this is appears that if there was a greater educational outreach, perhaps more people would be likely to seek life insurance coverage.